As long as the troops and terrain were laid out, and the rules still needed testing, it seemed a good idea to run the game through again. (see previous post) I don't have the patience to keep refighting exactly the same battle so I made two small changes. The first was in deployment, I revised the Spartans so that the main body was halted awaiting the detachment that had lagged behind and which was now on its way and pulled the Athenians back level with them. but heading off at an diverging angle. This fits my reading of Herodotus better. The second change was to remove the Elite status from the Greeks as along with having 3 generals for 5 units, it made them too strong. I now set both sides free to follow what ever tactics and battle plans seemed good to the commanders. The end of turn 2 from behind the Persian lines as my camera batteries die. 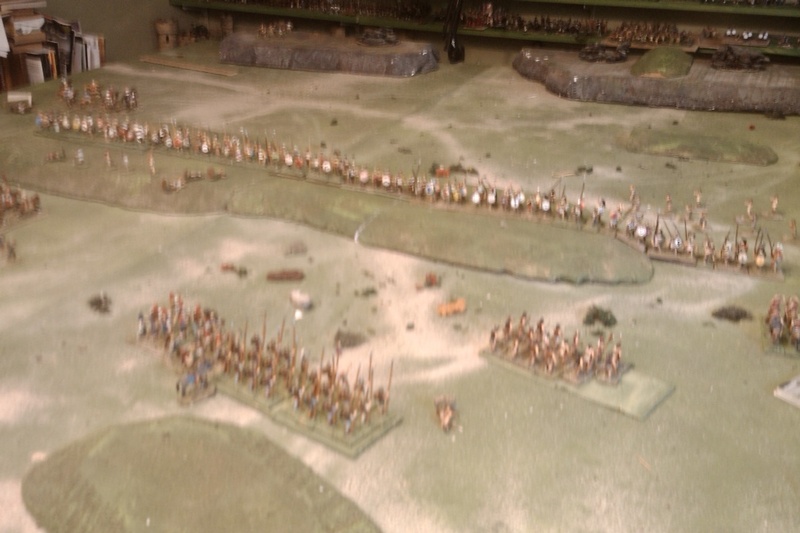 Having more room to maneuver, certainly helped the Persians to cross the river and get sorted. However, the Greeks made excellent time and were well formed on the ridge before any but Persian light cavalry had made it up to harass them. The Immortals, led by their general were particularly bothersome as after rolling low, I decided to hurry them which resulted in a few extra inches at the cost of a disorder which cost me several turns to clear. Patience is a virtue. The cellphone camera comes out as I decide the Persians have no chance of winning this one. While the Persian cavalry and light infantry cleared off the Spartan skirmishers, the main clash came again on the Persian right against the Athenians. The Thebans, who had also tried to hurry across the river were stranded in disorder in the mud (4 1's in a row ), only the presence of their general stopped them heading full speed for the board edge). The Phyrgians had their blood up though and headed straight for the Athenians, supported by a unit of Caduscian Light Infantry. Heedless of the disparity in numbers and a few straggling casualties from bowfire, the Omega Battalion charged down into the enemy. They sent the lightly armed archers reeling but the heavily armed Phyrgian spearmen struck hard and the Athenians themselves recoiled in disorder. The Phyrgians followed up on the next card but aided by the hill the Athenians sent them back down the hill. Next turn was another tense card draw and again the Greeks won. No problem except suddenly the difference between elite troops led by a general and an ordinary unit on its own came into play. The officers were unable to steady the ranks, and only 1 casualty rejoined while 1 left the field for good. The Corinthians who had also charged down the hill and driven back some Saka, fell back onto the hill. On their turn, the Phyrgians ordered their ranks and not pausing to rally, charged back up the hill, this time forcing their way onto the top. One more push on the next turn and the Athenian battalion dissolved under the pressure and headed for the hills. On their right, the Corinthinians were dismayed and recoiled in disorder. The Athenians break and I wonder if I was wrong. On the Spartan end of the line, it was the same old story, the Persians plied their bows, inflicting a steady stream of casualties and the Spartans shrugged them off and just kept rallying back the hits. On one turn only the Persians had a chance, a faint chance of causing a morale check but couldn't get through. Finally, Pausanius decided the omens were right and the Spartans swept down the hill, once again after a short struggle, the shield barrier was broken and the Persians forced to recoil. This time, however, the Persians had cavalry around the Spartan flank and rear and after the desperate fighting, the Beta battalion was down to near 1/2 strength. Charging in from the flank, the Crescent Light Cavalry smashed into the Spartan flank, they recoiled in good order but Pausanius went down in the struggle. In came the Horsetails, the Spartans recoiled in disorder only now they were below 1/2 strength. Under a hail of arrows they broke, The Alpha battalion formed to charge the now rallied Immortals but the storm of arrows from all sides threw them into disorder and finally the Crescent light cavalry rode down the survivors. The Spartans are ridden down and I start wondering whether Carthage or Sicily would be next. On the far right of the Greek line, only the Athenian Sigma battalion supported by their loyal archers remained. Caught between the anvil of Theban hoplites to their front and the hammer of the hard fighting Phrygians approaching at last from the rear, they hurled themselves on their traditional foe but were unable to break through. The end was not long in coming. So, unlike Marathon, (see January refight) this battle, the Persians were able ro turn the tables. Would they have been able to do it if the Spartans and Athenians had maintained their Elite status? Possibly, especially if I had promoted the Immortals to Elite. But 2 replays is enough for me. On to something different. 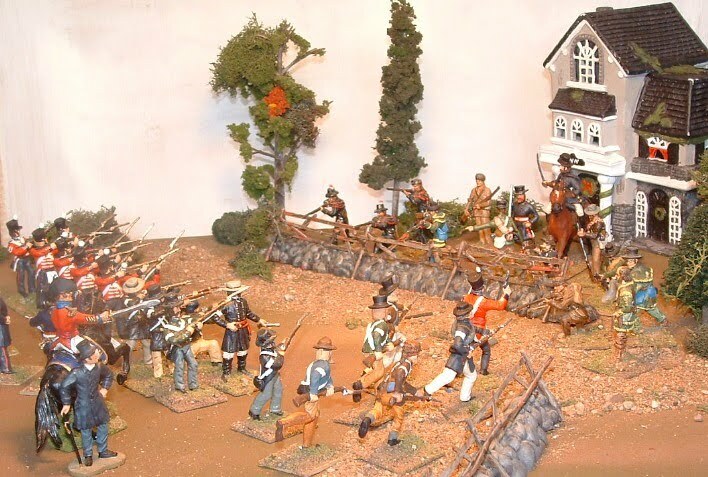 Sometime this fall the Lydian Campaign will resume, but for now its back to horse & musket. Charles Grant's book, The Ancient Wargame, has been in my wargames library since the mid-70's. My favorite part was always the battle reports. So, since I needed to test out a new set of home grown ancient rules named Gathering of Hosts after my ancients blog, I decided to stage the Platea game from Grant's book. I won't go into detail on the rules, those who are interested can look them up on google docs, (plse note that this link now points to the Apr 2011 edition of the rules which is a little different in mechanics) but basically they work by drawing ordinary cards red for one side, black for the other. Each card allows a player to activate 1 unit or 1 group of units and complete movement, shooting and melee before pulling the next card. For those not familiar with Platea, it was a battle between the Persian Empire and an alliance of Greek city states in 479 BCE. The Greek army was composed primarily of heavy infantry while the Persians depended heavily on archers and cavalry but had a substantial force of allied Greek heavy infantry as well. The two armies had been facing each other across the Asopus river for about 10 days when the Greeks decided to pull back during the night. To make a long story short, it didn't go quite as planned and their army was split into widely separated detachments when day broke. The Persians immediaetly launched an attack to take advantage of the Greek's disarray. Grant's version is typical of the way he rendered down troops and terrain from historical battles in a practical fashion to make a balanced wargame while maintaining the key elements of the original battle. One can argue with some of the details and choices he made, for example, amongst other things, I think the battle should take place on the 2nd ridge, not the one overlooking the river, but in the end, it works. Rather than design an alternate version, I decided to play it as straight up as possible given the differences in rules and in troops available. This included trying to follow the original game's battle plans as much as possible. The order of battle as adopted my me can be found here. The unit names refer to Grant's names but for the sake of those with the book I will try to stick with them in case they wish to follow along. Here is the game set to begin as seen from behind the Persian lines. Please click on the pictures for a full size view. Starting wth the Greeks, on our right we see 2 units of Athenian hoplites supported by archers. To our left, we see the Spartan Alpha battalion with its accompanying skirmishers. In the distance behind them is the other Spartan units in column heading for the rear table edge. In the far distance on the right we see the Corinthians. In the center of the Persian line are the Crescent Light Cavalry (white caps) with the Cadusi and Apadan light infantry behind and to the right of them. We can also see the Phrygian heavy infantry. 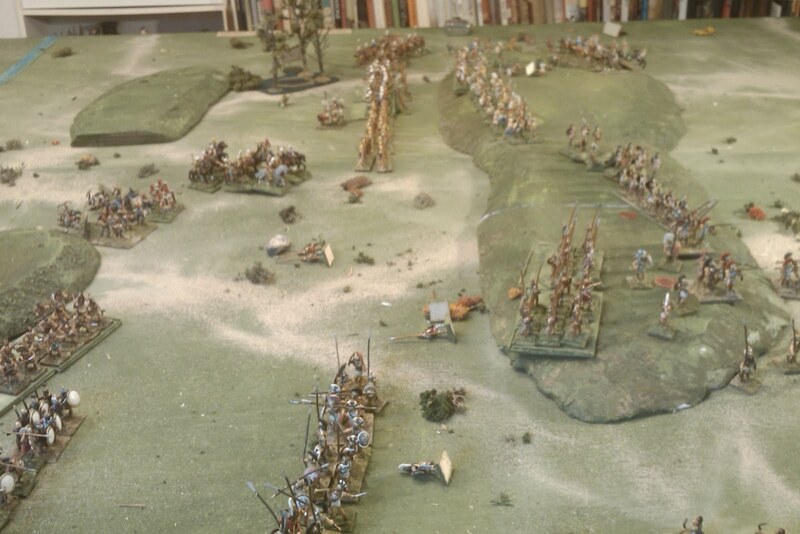 Just off camera to the right of the Persian line are the Theban light cavalry and the Boeotian Hoplites. Off to the left are the Scorpion Elite Medium Cavalry then 2 units of Persian infantry, the Green and Black Immortals, screened by the Median javelinmen. On the far right are the Horsetails light cavalry. The view after turn 1. The game opened up with the Spartan main body wheeling about to come up on the right of the unit left behind. This required the unit to hurry and being elite with a general attached, they needed to score 2 or better on a d6 to do so in good order. A '1' duly showed up. 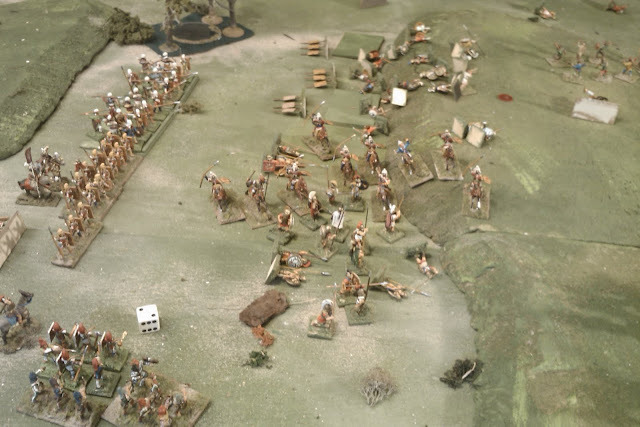 Elsewhere the Persian light cavalry surged forward but their infantry struggled with the stream and continued in some cases to do so all game rolling an incredible number of 1's on their movement distance dice while getting their feet wet. The Spartans, now in disorder, only needed a 3 or better to regain good order and push on. A 2 duly came up and the Horsetail Light Cavalry, following the script in the book, launched into a charge on the diordered column. Seemed like a rash venture for light cavalry to me but it wasn't going to get much better than this and it almost paid off, they sent the accompanying skirmishers scurrying off in disorder and tied the hoplites during the 1st round of melee but were finally forced to pull back in disorder after heavy casualties. On their next turn they failed to rally and rode off the table instead leaving the Spartan Beta Battalion to resume its march in peace. The Crescent Light Cavalry playing their part. In the center, the Crescent light cavalry started to head through the gap to try and slow down the Corinthians but the book says they "collided" with the Athenians, probably a function of simultaneous moves, in any event, I ended up halting them in front of the Athenians, and then having the latter charge them with predictable results, having bungled their attempt to evade, the light cavalry fled the table. On the Persian left, the Median javelins drove off their opposing numbers though they did so with missile fire rather than charging in as per the original. They then withdrew to let the Immortals come up and open fire on the Spartans. On the Persian left, the Thebans crossed the river under showers of Athenian archers and advanced on the Athenian hoplites. As they got closer, the Athenians sounded the paean and charged. Here the Athenians were supposed to sweep the Boeotians away but despite having deployed my favorite Benassi hoplites and having classed them as Elite, the raggle taggle collection of hoplites, Apulians and Carthaginians that composed my makeshift Boeotian unit gave them a beating and forced them back. All now depended on the turn of a card, if the Persians came up first the Boeotians would charge in and finish the job. But, no, it was a Greek card and the Athenians rallied atop the ridge and repulsed the Boeotians handily when they came, following up and eventually scattering them to the winds. On the Greek right, the Spartans were finally reunited. Sheltering behind their shields against a storm of Persian arrows, they waited for omens to indicate the right moment to charge. A charge by the Scorpion cavalry which momentarily drove back the Spartan left flank showed the time was not yet. In the center, the Athenian Omicron battalion followed up its success by driving off the Caduci Light Infantry and then hitting the Phrygians. These put up a surprisingly hard fight and momentarily held off the Greeks. From behind their wall of shields the Persians darken the sky with arrows. As the Corinthians finally arrived in the center, the Athenians finally swept away the last of the Phyrgians and began the advance on the Persian camp. Atop the hill the omens were finally good and the Spartans charged the shield barrier erected by the Immortals. A fierce, hard fought melee followed but the end result was never in doubt. The Immortals crumble under Spartan pressure. So ended my refight of Charles Grant's Platea. The rules used were different and I had been forced to adjust the number of figures though not the number of units but the results were strikingly similar and reflected the historical outcome fairly well also. More than that, the rules played smoothly and the game was fun. even solo. I think another game is in order! There are few people who would seriously contend that in life, and especially in war, that things always happen the way the person in charge wants them to happen, when they want them to happen. The question is more one of how much of Clauswitz's friction to include, which methods to use to model it and how much influence or control to give the player. Now, just to be clear, I was a fairly early advocate of chaos and friction. By the mid 80's I was using card activation by brigade, command control rolls for subordinate commanders, and soon after variable movement distances. Oddly, although combat & morale was dice based, I made several attempts early on to increase the predictability. Since generalization and categorization often makes discussion easier despite being occasionally unfair in detail, I am going to take a stab at breaking wargames into 2 broad categories which form a continuum with a large overlap which I will include as a third category in its own right. CONTEST OF WILLS. These are games with maximum player control relying primarily on one's opponent to provide friction. We can start with LittleWars: fixed moves, no control or activation roles, no dice used in combat. The only variables are the skill of the player with a 4.7" naval gun and the actions of his opponent. The Complete Brigadier took this even farther with dice-less calculated combat. More commonly these days, this sort of game would use fixed movement distances, alternate moves and no unit or command activation. Friction comes from your opponent's actions and from the use of dice in combat and sometimes morale. Volley & Bayonet springs to mind and its worth reading Frank Chadwick's Game Design notes which are available on line. The Venerable CHARGE! also falls into this category. RIDE THE WHIRLWIND. These are games where the player has to struggle against the system as well as against the enemy. Usually there is some form of unit or command activation and combat and morale systems with a high random element and the potential for extreme results. Other common forms of friction are variable move lengths and card activation rather than a fixed turn sequence. The end result is game where the player can usually make choices which maximize the chance of success when it comes to carrying out movement without being able to guarantee it and where combat can result in sudden and drastic turns of fortune leading to players always feeling a little on edge and never really in control (hence riding the whirlwind). In extreme cases, it is usually possible though improbable that on a bad day, one could remove the enemy's army altogether and still have an attack fail to take its objective. The French & Indian War version of my own With MacDuff rules developed in the early 90's would fall into this category as would many popular sets today such as Warmaster, Blitzkrieg Commander and similar games as well as some of the Two Fat Lardies games and others. THE MIDDLE GROUND. These are games which include some or all of the elements of the Whirlwind but in such a way that either the friction is not decisive or a player can guarantee some level of success. The Sword & The Flame springs to mind, the play sequence is card based and movement is variable based on throwing a number of dice but all units will be given a chance to move and even on a bad die roll, the unit will creep forward. Combat and morale are dice based but extreme results are rare and troop behavior predictable in broad terms, your British regulars might falter and they may break after heavy casualties but they won't run off the table screaming at the first sight of the enemy. Fire & Fury is another popular game that i would include here. There is an activation chart but a player can often arrange a guaranteed minimum result for well led fresh troops. Combat results can vary and are based on a single die roll or the comparison of 2 single die rolls but there are upper and lower limits to the results that die roll can produce. DBA is yet another popular system that would fall here. Oddly, while the F&IW version of the MacDuff makes it into the whirlwind category, the original version written for Colonial games would fit here since troops within the command range of the general did not have to take a control test, they only had to contend with variable moves. In the end, the common thread of the Middle Ground is that there are variables to complicate things but if you remove the enemy army, your troops may struggle if they roll nothing but 1's, but they will get there eventually! Its interesting now that I look at it, how many very persistently popular sets fall into the Middle Ground, TSATF, F&F and DBA all range in age from 15 to 25 years and are still widely played in more or less their original form despite minor changes. I enjoy and play games that fall into all three categories but find that Contest of Wills type games often lack somewhat if no opponent is available and a large proportion of my games these days are played solo. Ride the Whirlwind games can be fun, especially if taken lightly but I do find them frustrating on days when the luck is consistently bad for either side and also find that the longer and more complicated the scenario, the more frustrating it is to have everythung spoiled by a couple of bad die rolls or card turns. By default this seems to point me back to the Middle Ground, an area I haven't spent much time in recently. Something for me to contemplate as I prepare to refight Platea on the weekend. Painting at last! Nothing like a game to inspire. The Belmont Volunteer Battery in training as Hants County arms itself against the threat in neighboring King's County. The glue is still drying on the bases as these Airfix and Imex 1/72nd prepare for battle against Jerry's rebels. Hopefully I haven't bored everyone away, this has been a very useful exercise for me. I now have a clear understanding of how I could stage several of the engagements of these 2 rebellions as historical wargames and a good understanding of why I don't want to go that route. Even better I now have a pretty good idea of how to incorporate this interest in revolutions with an existing, but sketchy, planned alternate history project. In short, I wish to take facets of various revolutions in different lands and different times, dress the troops in uniforms from the 1830's, set them in local terrain and come up with a series of games that can be played solo or with one or more friends with the capability for some of them to be serve as a multi-player club or convention game. I may have been born and raised in Montreal but I have lived in Nova Scotia for more than 30 years and my roots have sunk into the ground here in what was the historic Newport Township at the head of the Annapolis Valley. This is home and here is where the revolution will begin! Joseph Howe was a 19thC journalist and politician whi is credited with leading the peaceful struggle for Responsible Government . Something Nova Scotia obtained in 1848 without a revolt, the 1st British Colony to do so. But in 1835, Howe went on trial for Seditious Libel because he had printed articles attacking corruption amongst politicians and police. The trial judge ordered the jury to find him guilty but they refused. What if he had been convicted? What if reform minded hotheads had followed the path of Upper and Lower Canada and dissent and clamour for reform had led to armed revolt 3 years later in 1838? What if Maine took advantage of the distraction to push her border claims along the Aroostock just a little bit harder? I won't sully Joe Howe's name but will use his trial as a turning point for my agitator John Watt and his associates. Here is history with one small alteration suddenly opening a host of alternate or fictional possibilities. The organization for my 40mm 19thC toy soldiers has been see-sawing back and forth over the last 4 years as I tried to figure what exactly I wanted to do. They have been on bases, off bases, onto other bases and lately back onto single bases again. They have been companies, big battalions and small regiments, prepared themselves for skirmishes and for battles. All the while, recruiting has lagged until I could decide what I wanted. I'm still not sure why and when I decided that I wanted to play battles with regiments not skirmishes with companies, perhaps I had just been having too much fun? Anyway, I don't actually fight battles and sometime the obvious fit is the way to go and after all, I have an ACW 1/72nd project lurking for the battle thing. So the company/troop/section will be the basis of organization and scenario design. Will it be Charge! companies of 16 plus officer, sergeant and drummer, old MacDuff companies of 12 including officer and sergeant or maybe the newer 8? That still remains to be decided after some test games. Perhaps one day I'll play out an actual campaign but I'm in no hurry, wouldn't want the whole thing squashed early on! In the meantime, I have already thought up a dozen existing or easily written scenarios which can be adapted and applied. The idea is that each should be able to be played a couple of times without wearing them out. Assuming optimistically that I play 8 to 12 a year in addition to other periods and games and assuming I develop additional ones, that should easily provide 5-10 years of gaming. rebel sympathies with orders to seize any or all of : A Rebel leader, a cache of arms, printing press etc. This is inspired by St Denis, Montgomery Tavern and by Lexington but is based on a variation of one of the scenarios published with the original Colonial version of MacDuff. The rebels divide a deck of cards between 2 stacks, one in a village, the other in a tavern or Inn. The aces signify prizes worth capturing. Neither side knows where they are (the rebels know where things are but perhaps not what is important to the government). The rebels get to remove 1 or 2 cards per turn. If the government seizes a stack, they get all the cards which are left. The goal for the rebels is to delay the government troops long enough to get their leaders/caches to safety. 2) BY THE RISING OF THE MOON. The rebel forces, mostly unarmed/pike armed gather and march on a local armory which is inadequately protected by local militia. Various reinforcements and routes can be added for complexity. A variation on several CS Grant Tabletop Teasers where the rebels need to blow a bridge to stop the advance of a Government column. Based on the rescue of Davignon and Demary in Quebec in 1837 it may end up being a variation of a CS Grant tabletop teaser. Rebels suprise a party of troops escorting a carriage and seek to free the prisoners. Alternately, the carriage might contain the Lt Governor who would make a valuable prize. Inspired by the Alamo, the Windmill and St Eustache as well as one of the CS Grant scenarios, the rebels have occupied Fort MacDuff, an abandoned fort dating back to the 18thC. They are hoping for the arrival of schooners full of Patriot Hunter volunteers from Maine but the government army arrives first. An option could be to have the schooners arrive! (Ft MacDuff which I have been intending to build for some years will reflect either or both Ft Anne or Ft Beausejour. A schooner or 2 of Patriot Hunters from Maine arrive in the Minas Basin and land troops at Grand Pre, expecting local rebels to meet them but Government troops get there first. This may have several variations. One side or the other makes a night march and launches an assault at dawn. There are several existing scenarios by S Asquith and CS Grant as well as Stony Creek. The rebels are retreating and take advantage of a defile to try and hold off the advancing Government forces. There are a couple of Grant Scenarios that I could use but probably the one from Wargame Scenarios. A variation on the Tabletop Teaser from Battle games. Loyal volunteers are in a retaliatory mood and attempt to burn out rebel homes while rebel forces try to protect what's their's. A variation on my Belle Famille scenario from the 1759 siege of Ft. Niagara which was published with the F&IW version of MacDuff. A rebel force is moving along the River Road past uncut forest and a Government force deploys in a clearing to stop them . Hmm I've just thought of several 1812 and AWI scenarios that could be adapted as well. Not to mention the attempt to capture the hot air observation balloon! or some Aroostcok scenarios. Now I need a catchy project name! or perhaps Revolution! is it? "Bring my gun and a handful of silver"
The rebellions in Lower Canada (Quebec) were of a different nature and provide a very reasonable basis for a "what if" campaign. Mostly a what if the leadership had of been as brave and determined as the rank and file? The initial action at St. Denis makes a good game straight up but after the collapse of the senior leadership, we see increasingly large government forces attacking ever dwindling numbers of rebels or Patriotes. The last stand in the church at St. Eustache was as brave and determined as any Alamo but as futile a gesture as can be imagined. Since I want to go the route of "inspired by" rather than "exactly reproducing" I am just going to leave you with some trimmed down utube versions of part of the CBC's excellent People's History of Canada series. The next post will be back to wargaming with a dozen Rebellion scenarios sketched out for my, still being designed, fictional, 2nd Acadian Rebellion of 1839 campaign. 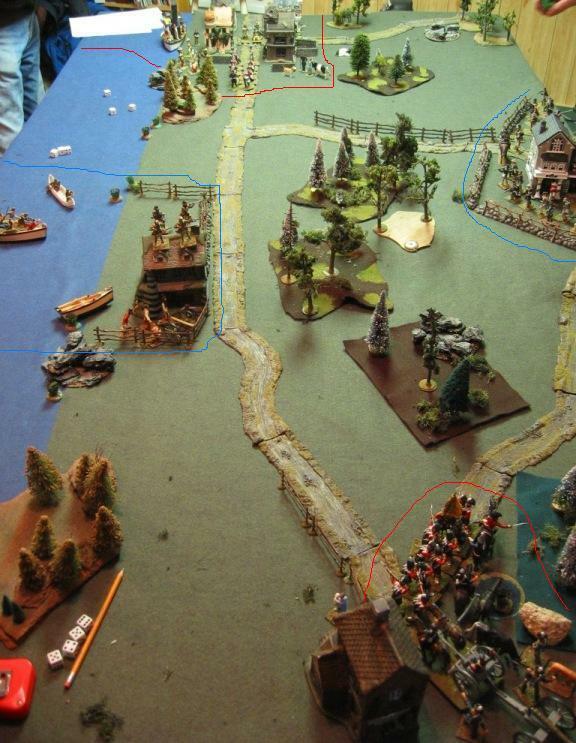 "Come Patriots All" was the name I gave to the 1837 Rebellion game that I ran at Cold Wars in 2004. I had put in from my mind almost entirely which struck me as odd when this thread started itself. Never mind that this game won me my first solo Battle Streamer Award, but it had many of the elements that I was chasing in my "Oh for a Muse of Fire" post last month and was the only Rebellion game that I had run, (well the only 1837 Rebellion, in 15mm in years past there were those Vendee games, oh and Guadaloupe and then....hmmm an unoticed trend seems to be developing), More than that, I think I now understand exactly what I was trying to achieve and why the game worked even though I didn't really think much about either at the time, I was just designing a small 54mm multi-player convention game which I wanted to be a little out of the ordinary and to see my rebellion figures take the table. Mind you while exploring it this week, I think I figured out why it more or less disappeared from my mind afterwards. Some of you can probably figure that out, the rest will have to wait or skip ahead! Unfortunately, I don't have any photos of the actual game, one of the many downsides of GM'ing a game solo. Fortunately, I have the next best thing, some pictures which Lawrence, our official photographer, took of a version of the game played at Gary's place 2 years later. 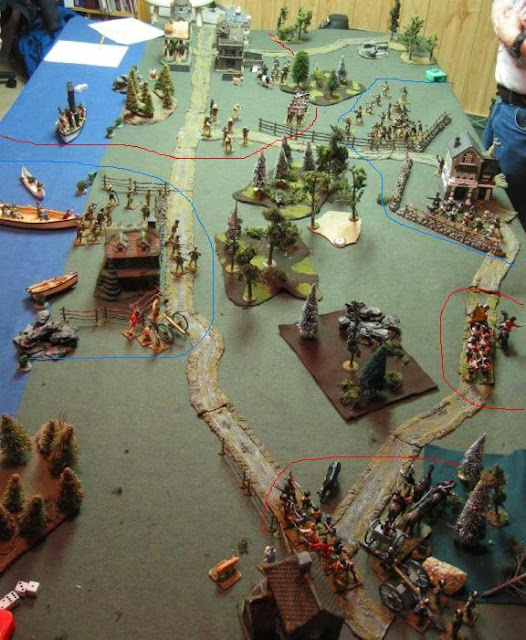 At the far end of the table on the left, outlined with a thin red line, is a town containing an armory with muskets and powder to be issued to the loyal militia and where the RN gunboat is stationed. In the middle ground on the right is the Inn where the rebels are gathering. Across the woods from it is the village where the Patriot Hunters are landing. (The table was a foot narrower than the one I originally designed the game for but it worked. ) Finally there are various roads leading off the table, most of which will see units of one side or the other arriving at various points. a) The Patriot Hunters. Their mission was straight forward. link up with the Canadian rebels and give the red coated Tyrants a bloody nose, oh, and, umh best keep the lines of communication open for reinforcements to come in or in case a retreat looks necessary. They begin the game with a small beachhead on the Canadian shore and the rest of their volunteers back in the US, across the St. Lawrence. A handful of small boats are available for ferrying volunteers. A Patriot 6 pounder 'borrowed' from the New York Militia as was done at the Windmill. b) The Garrison. This is composed of Permanent Militia including one of the Coloured Companies but the call has gone out for the sedentary militia to gather and companies are expected to arrive by various roads. The companies marching in have white arm bands which they are told is to identify Loyal Militia. Their main mission is to guard the Armory but the Major is a rabid Loyalist and Tory who despises Reform and Republicanism and has a burning desire to burn out the rebels that he has heard are gathering at the Inn, and hang their leader. c) The Royal Navy. Thorough professionals, the gunboat and a company of Royal Marines are to repel any attack and assist local authorities. Their primary mission is to control the waters up to the international boundary (which conveniently follows the table edge) but they are not to violate US Neutrality. d) The Army. More professionals but backed with militia. They march in from the foreground and their goal is stamp out the rebellion and repel any invaders. Period. The General knows the Armory is being guarded but doesn't know anything about anyone else on the table. 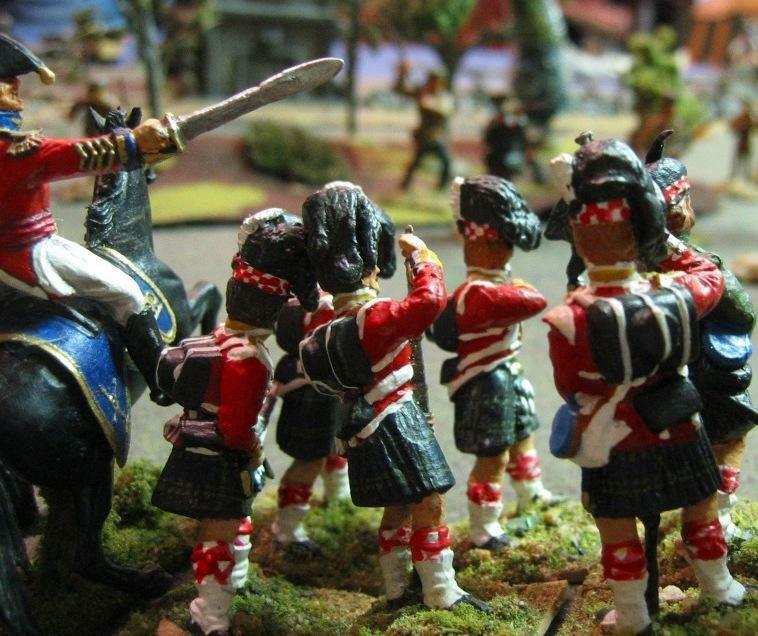 The 93rd Highlanders attempt to trade fire with Patriot riflemen lurking in the woods. e) The Rebels. Last but not least, their mission is simple, gather enough men on table, march on the armory, equip the pike armed men and over throw the government. They start with a small force at the inn but more men are expected down the various roads. Yes, the same roads that the loyal militia are arriving on. No one has told the rebels about the armbands. The only real twist though is the secret condition for the senior Rebel leader. His life is obviously way more important than anything else so while he will win big if the Rebels succeed, as long as he can survive the game and escape to the US then he wins. The Rebels and Patriots converge on the town. were to rendez-vous with took a pasting. It didn't help that some of their reinforcements were surprised on the road and despite a bold pike charge, dispersed. The Rebel leader sized up the situation, slipped into the woods and made a mad dash across the table, securing a place in the boats. In 2006 the Patriots used their gun to hold off the militia reinforcements. (you need something more than militia if you're going to push columns into cannister) The Highlanders were sent to disperse the Rebels but ran afoul of Patriots pushing though the woods. It was the old story redcoats with muskets in line in the open against riflemen firing from cover. The remainder eventually fell back down the road. On the far side, the Rebels and Patriots converged on the armory, stoutly defended by the Coloured Company and Royal Marines. It was nip and tuck until the Rebel leader urged his horse to the front and.....was shot down from it. The rebels dispersed and the Patriots had little choice but to make a run for it. So why did I put this game out of my mind? Essentially because its now been done! The game was too complete, three games in one. It was also a multi-player game which relied heavily on player interaction and choices and would not translate well to a solo game in its current form. However, it does point the way to me and that will be the next post. When I started planning to game the rebellions about 10 years ago, my original idea was to recreate the Battle of the Windmill (Plan A from my last post) but I ran into several issues which led me to change my mind. The first is that I'm not one to play a game over and over so doing special terrain pieces doesn't appeal to me. The second is that the battle was essentially an invasion despite the inclusion of a few Canadian exiles and the misplaced hope of local support. I wanted something that evoked the spirit of revolution, including the third item, pikes! This image by C W Jeffries is iconic for me. Only a small number of the Canadian Rebels who gathered at Montgomery's Tavern in December of 1837 had firearms so a plan was hatched to seize a government arsenal. Unfortunately for the rebels, while most of their leaders were unsuited to their role both by experience and temperament, one of them appears to have been a student of tactics and history. He drilled them to attack in column with musket armed men in front. Each rank was to fire a volley then throw themselves onto the ground until the way was clear for the pikes to charge past them. It might have worked in daylight but as it happens the clash with loyal militia came at night and while the musketmen did their part, to the men in the rear, confused by the dark and the noise, in the flashes of the muskets, it appeared that entire ranks were being mowed down by enemy fire and they fled into the woods. - resistance by loyal militia. 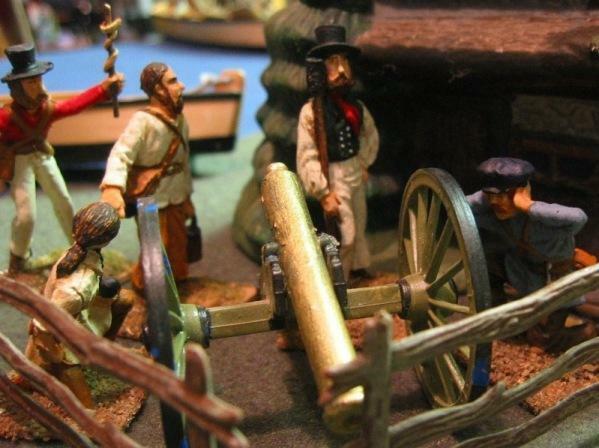 54mm plastic and metal figures converted for the 1837 Rebellion. The next post will look at how I combined those 7 elements to stage a game which on the surface was a fictional 'what if' skirmish but which can also be seen as an encapsulated version of the entire rebellion in a 3 hour wargame. Loyal Militia gather to defend Toronto. 54mm plastic & homecast metal conversions. In this 2002 original shot they are on their Morschauser bases. Within a few years they reverted to single figures and are now in the process of being replaced by 40mm. I've been remembering evenings after too long days of work, sitting with my cat in my lap, idly pushing unpainted figures about on my desk, trying out organizations, imagining conversion posibilities, new projects, uniform details....doing almost anything except paint the gorram things and get the projects on the table. So I guess I am another who has to be relaxed and have energy before I start painting if I am to enjoy it. So while still in convalescent mode and loaded with antibiotics, what better time to contemplate the coming campaign season and not yet realized toy soldier dreams? Now the matter at hand is a long cherished, occasionally dabbled in more often ignored or distorted or dreamt about wargame period, the 1837-38 rebellions in Upper and Lower Canada. The latter of these has fascinated me since I was a kid, the former was dismissed in all my history books and I was surprised about 10 years ago to discover that there were actual battles and skirmishes over the course of a year. There are a couple of approaches that I have considered over the years. A. The Historical Recreation: In this model, I would recreate exactly the right units in the right numbers and the right uniforms for each skirmish and battle. So, for example to do St. Denis, I need 300 British Regulars from the 24th and 32nd Regiments, with a howitzer and something like 5-800 Patriotes, about 2-300 of whom have firearms of some sort. This is a bang up skirmish, hotly contested and with the British being narrowly defeated. For St.Charles a few days later, I need 400 British from the 1st and 66th Regiments, in their red coatees and about 80 patriotes. After an indecisive firefight the British lowered their bayonets and charged, giving no quarter. You might see a trend developing. Putting all the events of both rebellions together, for a strictly historical recreation, there are less than 10 actions that can be teased into a game and only 2 or 3 of these will make a good game without either excess fudging or very clever non-traditional techniques. Of those, 1/2 involve the Quebecois in their traditional dress while the others involve largely Americans and a few English Canadians who look quite different. On the other side, most of the engaged British units were only present at 1 or 2 actions so strictly, different troops are needed for each action. If done as a series of projects and content to stage each game once or twice and then put it on the shelf, this is a valid approach and a good excuse to paint a few more troops. But that's not what I want, I want to paint fewer figures and use them more. B. The Stand In Wargame. This is where I would grab my 1812 British and any rebel-militia looking types, F&IW Quebec militia, 1812 Tennesseans, Texans, AWI frontiersmen, whatever and use them to fight out the battles. An OK approach if fighting the actions was the main drive, but its not, I want to recreate the prints! C. The Generic Wargame. 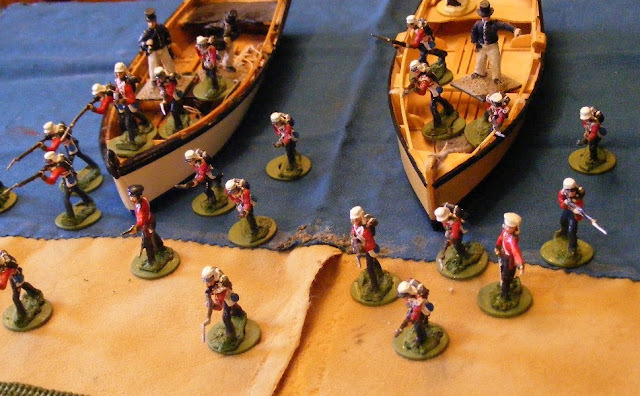 This is the traditional sort of thing where I paint up a bunch of Patriotes and a couple of units of British and then play wargames with them, maybe based on the real actions, maybe Table Top Teasers or whatever comes to mind. Very, flexible, certainly allows multiple troop use. The many trouble is deciding on which units and how many? Do I want to do separate Upper and Lower Rebel armies? or imagine a situation where they were able to team up? and what about those American Patriot-Hunters and the threat of US involvement? Oh Dear! Too many choices! No wonder I ended up trying to go completely fictional! Still in the end, this is the best route for me I think. Now in order to design the armies, I really need to figure out what sort of games I want to play. This is where I hit a roadblock that I just don't understand. The answer to what kind of game is obvious. 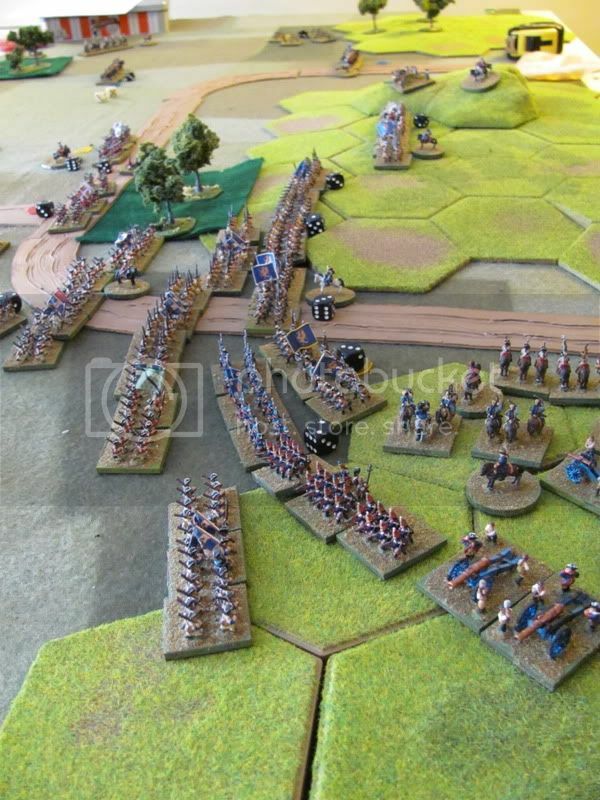 These are skirmish games of the sort that rules such as The Sword & the Flame, Sharpe Practice, Brother vs Brother, the big unit variant of Rocket's Red Glare etc were designed for, not to mention my own With MacDuff rules, and I have enjoyed many such games. So why can't I get myself to admit that up front and plan for it? Why do I keep eyeing the Palo Alto campaign to see if my latest rules will handle refighting it? I may have done the US troops in expectation of launching them into Canada but I have NO plans of building Mexicans or if I did it would be for the Alamo. So what is the problem? Perhaps what I need is a change in approach from my current one where I have been slowly, oh so slowly building generic armies to fight whatever scenario comes to hand and go back to an older technique that has worked in the past, design a game and fill that OB. If it works I can expand it, if not, I have a "game in a box". 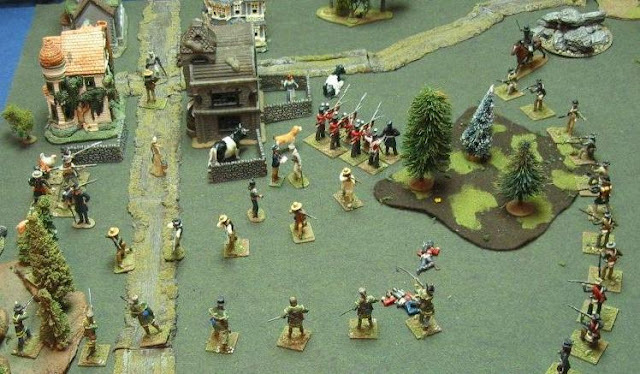 This post is long enough, my next one will look at the one 1838 game that I staged at Cold Wars a few years ago in 54mm. Come Patriots All. I had nearly forgotten about it but it actually touches on various gaming issues of illusion and so forth that I discussed last month. Hopefully I can find some pictures! From there I'll start planning the restart of the rebellion in 40mm. Five weeks on light duties! I thought I would get a ton of painting and sculpting done but no, hardly managed to lift a brush. However, I'm slowly getting back to it, a colour here, a bit of coat there. My new Scots don't look likely to win any awards but they should serve well enough when done. The stubby guy on the left with platform shoes is one of my old Minifigs, next to him is a Hat 28mm for size and then 2 of the partially sculpted Scots who seem to be suffering a degree of scale creep already. .
At this stage, it'll be Labour Day before I get to mold making but it is progress. Originally, I was planning to do 2 pike, 2 shot plus officer, ensign and drummer and spare heads then spin cast them but I am far behind schedule and it now looks like mid-late fall before I get my casting equipment set up so I have decided to go with 2 generic figures to be drop cast. Officers etc will then be converted from these. Luckily, I have seen several old prints of Scots musketeers without apostles so mine will also make do without so that the 2 figures may be finished as either pike or shot..
For some odd reason I have been in an awful painting funk and unable to settle myself but I have gotten a chance to push some soldiers about and thus test the updated version of my Hearts of Tin wargame rules. These started life as a Morschauser variant with troops mounted as per the rules with 4 infantry or 2 cavalry on a stand as a "basic unit" and 5 basic units to a "regiment". The rules evolved from there until a misguided attempt to turn my regiments into "big battalions" last year sabotaged everything. After much debate, an acknowledgement of the desire to field my 40mm glossy toy soliders on individual bases and a long experimental walk down Featherstone Road has brought things back to their senses. Some test games have banished the strangest ideas and reinforced some tried and true methods. HofT is now once again, my rules of choice for my sologames. Since I am looking at shutting down my website due to budget constraints, I am testing an alternate method of sharing documents. The current rules are NOT available on my website. The following link should allow anyone to view and download the current version. (link updated). The formating is a bit wonky in parts but you should be able to access it without signing in to Google. Any comments and feedback are welcome. Everyone is welcome to use as little or as much as they please from the rules. Please note that this is the basic game, basically what I need for my 1837 games as planned. Advanced rules to add more troop types, special weapons and tactics etc will be forth coming as I need them or in response to suggestions and comments. in response to the US slogan "54/40 or fight!" ** Thank you John & Jeff for testing the links, both old and new (post removd). I have updated the original post and it should be working now.